This man is passionate, some say crazy, to commercialize this sort of artisanal home cooking. Painstaking labor and long hours go into coaxing the flavors out of the handpicked ingredients. For the prices that he charges, I'm not sure if it makes any profit sense. 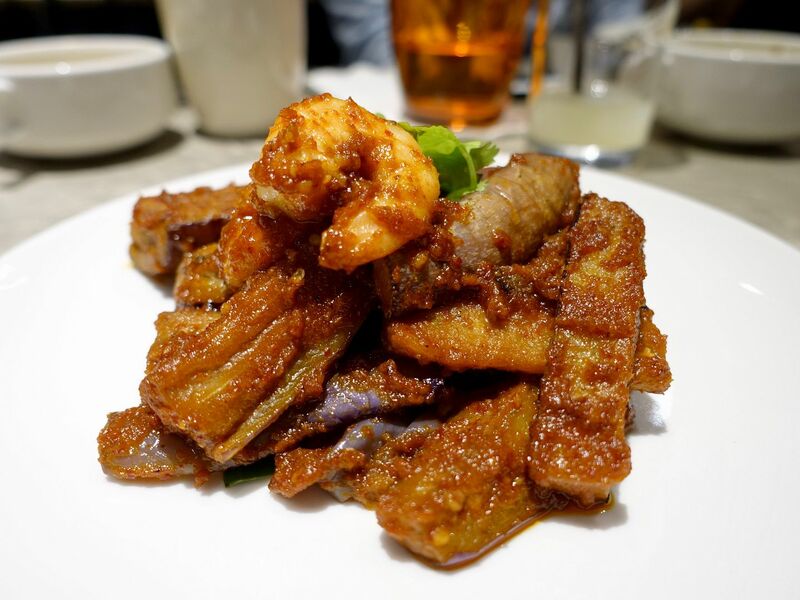 Let's bring on the rendang, chap chye, hae zor, assam fish and more! We started with some cold appetizers. A spicy refreshing start came in the form of a Four Angled Bean Salad ($12). 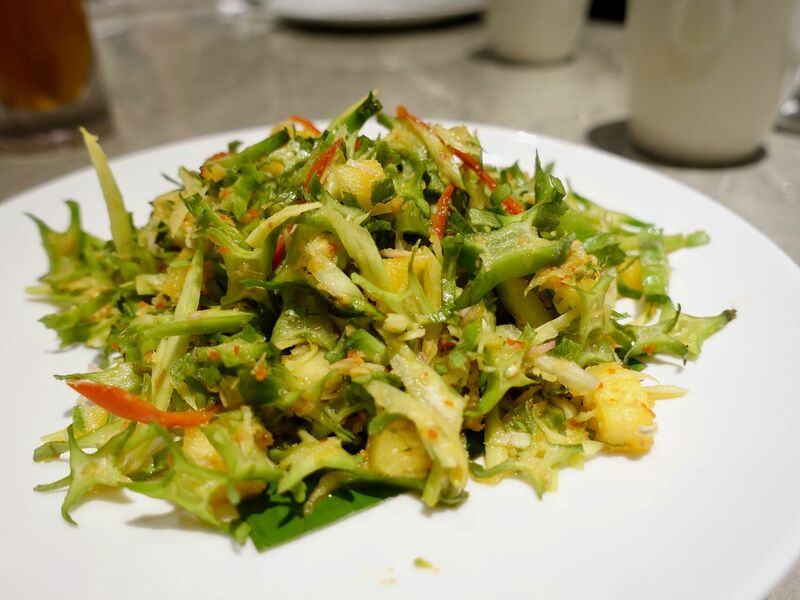 Green mangos, chilies, ginger flower and dried shrimps tossed in a sweet sour sambal belachan sauce. It can be very spicy! 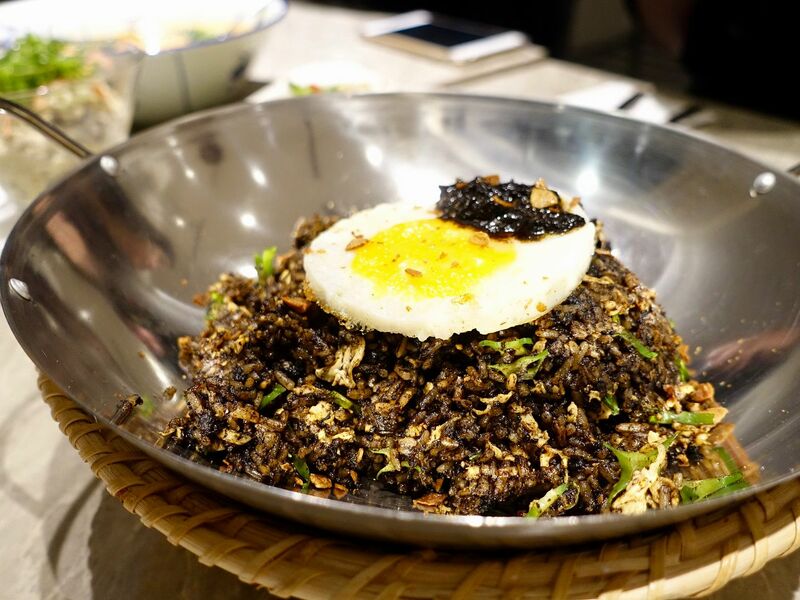 Cool the heat with the Chilled tofu with Pidan ($12), Chef's new creation that is a Japanese tofu and century egg mash with pickled lettuce, ginger, kikoman, onion. I prefer the usual version though. Ever heard of/eaten a Eurasian otah before? You must try the Singgang ($20) which is a deboned wolf herring cooked in a non-spicy rempah made with turmeric and gallanghal. It tastes exactly like the Malay/Chinese otah (spicy fish cake paste). This fish isn't popular with chefs because of its numerous fine bones which made de-boning a terrible chore, but Chef decided to stick with it because it's more authentic. Then there’s Sambal Buah Keluak ($22), another laborious dish where the pulp of the Buah Keluak nut is extracted by hand one at a time. The sambal and minced pork also takes about 2 hours to cook. 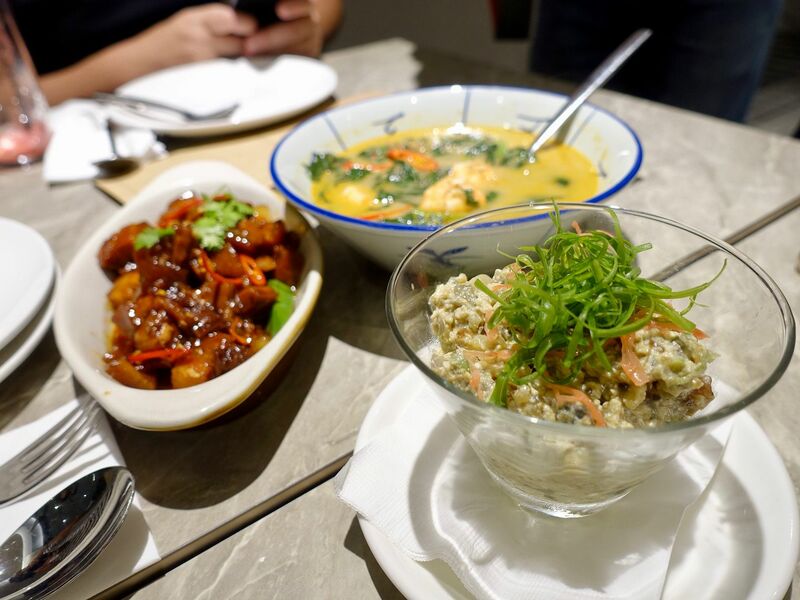 Chef Damian also serves the Sambal Buah Keluak Fried Rice ($22), a signature dish he created in 2001. The pork is cooked with the nut until it becomes a fine paste. I didn't even know there's meat in this! Anyway this is a must-order at Folklore. 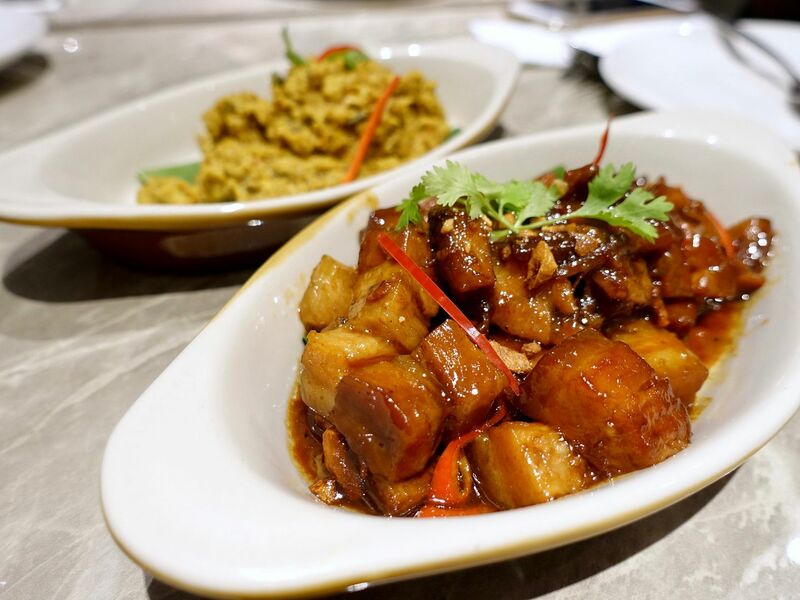 One of my favorite meat dishes is the Babi Assam ($22) which features a whole piece of pork belly braised in cinnamon, star anise, and tamarind. It tasted like the Chinese Sweet and Soup Pork with a light sweet sourness. 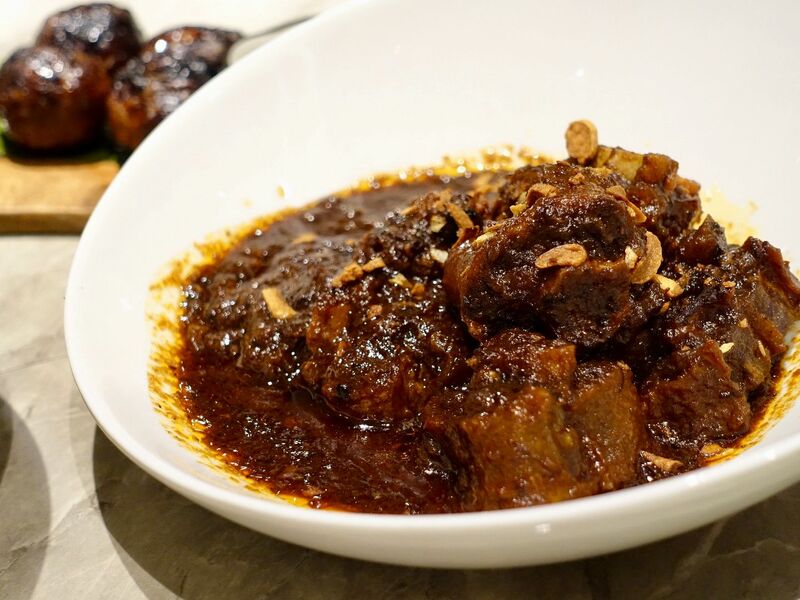 If you're for saucier meats, then go for the Beef Cheek Rendang ($32), or Mulligatawny ($14), an Anglo-Indian dish of shredded chicken and spices in a chicken broth with a faint accent of tamarind. 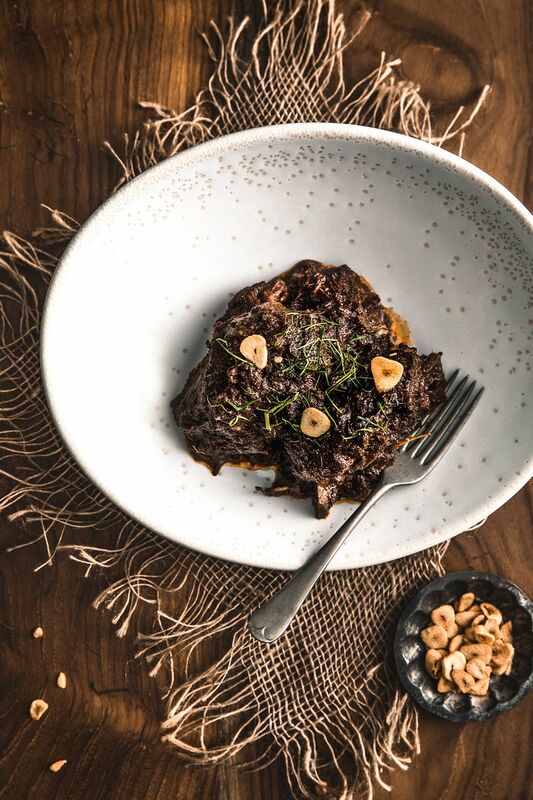 The Oxtail Stew ($26) is quite a standard Eurasian dish of thick and rich stew with potatoes and carrots. I don't eat it enough to know the standard but i can imaging craving for this on a cold night. Are you game enough for Pig's heart? The Hati Babi Bungkus (4pcs $18) is not really pig's heart, it only resembles it. 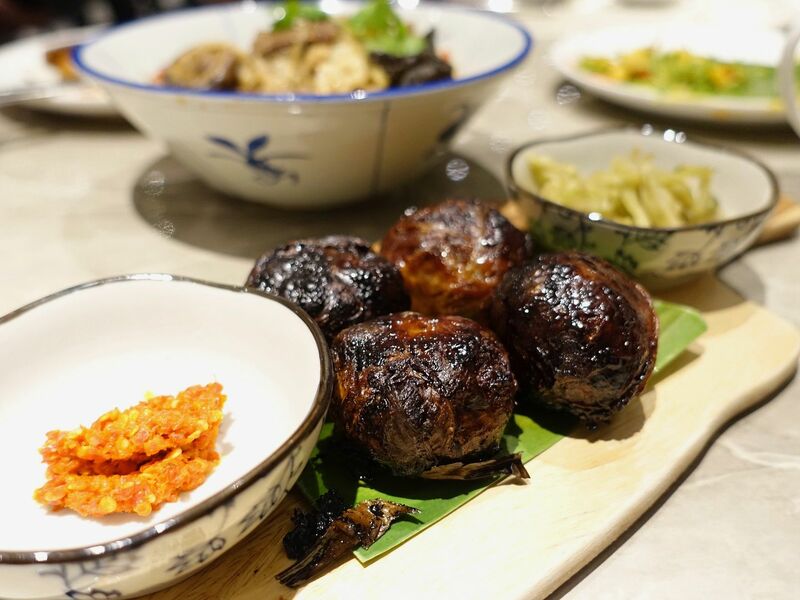 These balls are made with minced pork and liver marinated with coriander, tamarind, soya sauce and shallots, wrapped in caul fat then grilled and served with pickled mustard leaves. The filling could be juicier in my opinion and the caramel coat reminds me of kecap manis. If you can take spice, have a go at the tongue-numbing sambal chili. 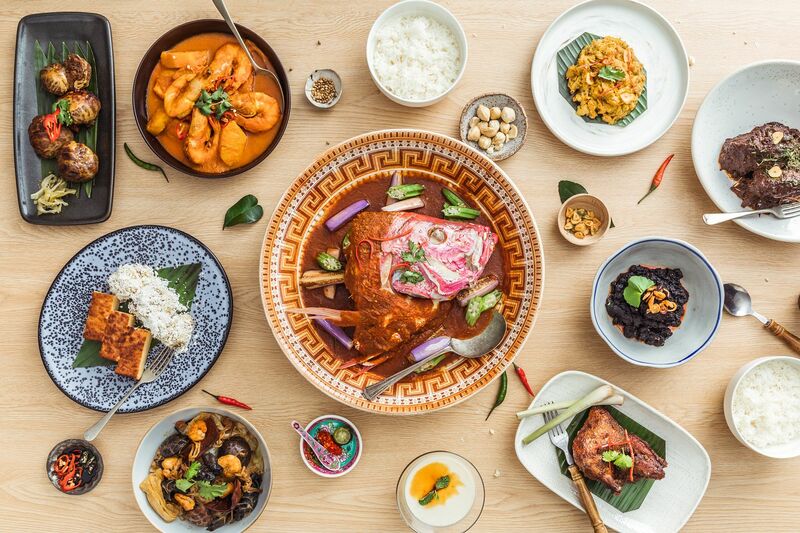 No heritage meal is complete without the Peranakan Chap Chye ($16). 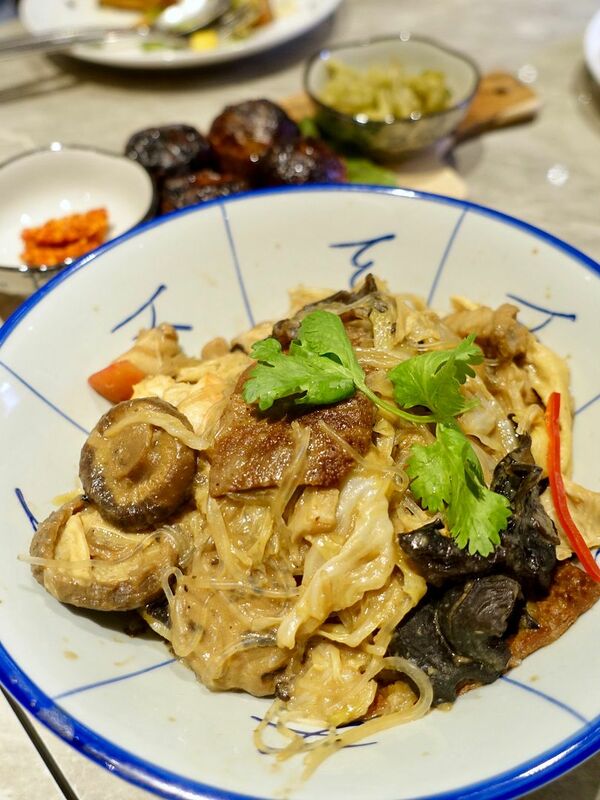 The medley of vegetables, beancurd skin, tang hoon, black fungus, and mushrooms are braised in a pork and prawn stock until they have fully absorbed the flavors. I would love for more gravy in this one but that's not stopping me from devouring a whole bowl by myself. The Masak Lemak ($14) is another interesting vegetables soup dish that is out favorite. 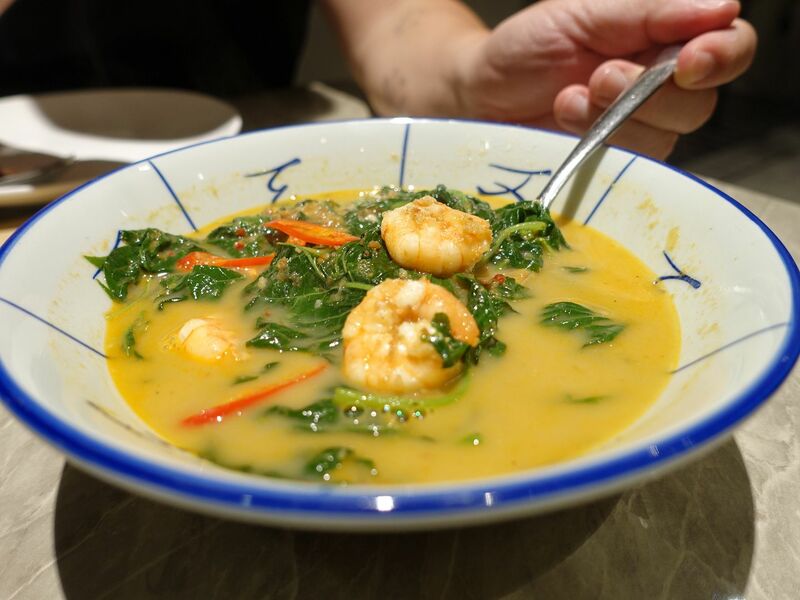 Chef cooks a mix of local vegetables like spinach, kang kong and potato leaves in this lightly spiced gravy enriched by coconut milk. 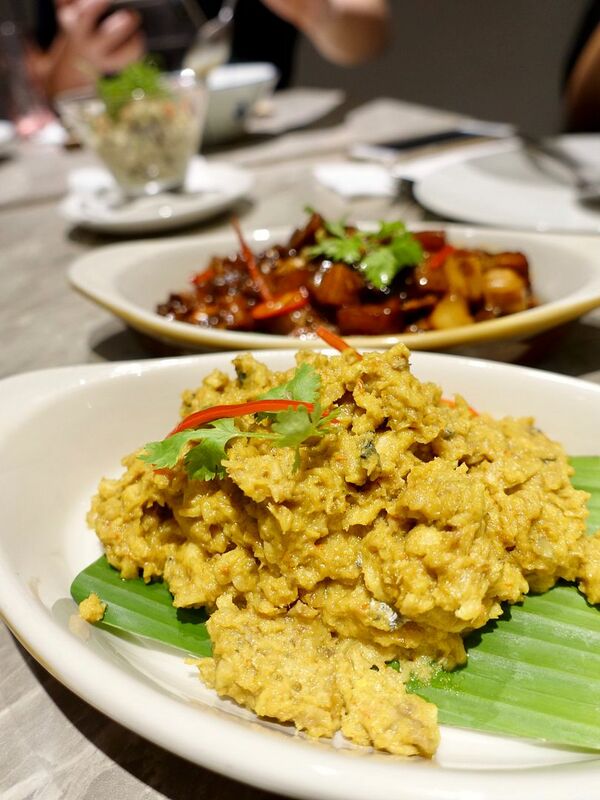 Of course, the Rempah Titek spice is house-made and is made up of dried chillies, shallots, shrimp paste and candlenuts. Of course we couldn't stop drinking that umami soup. The sambals at Folklore are truly delicious and we can easily finish a pot of rice with the Sambal Juliana with Fried Brinjal ($14). Sambal made with shallots, shrimp paste, shallots and chillies enhanced with fresh lime juice, gula melaka, and fried shrimp. Chicken, prawn, and fish stock are used the enhance the flavors of the eggplant. 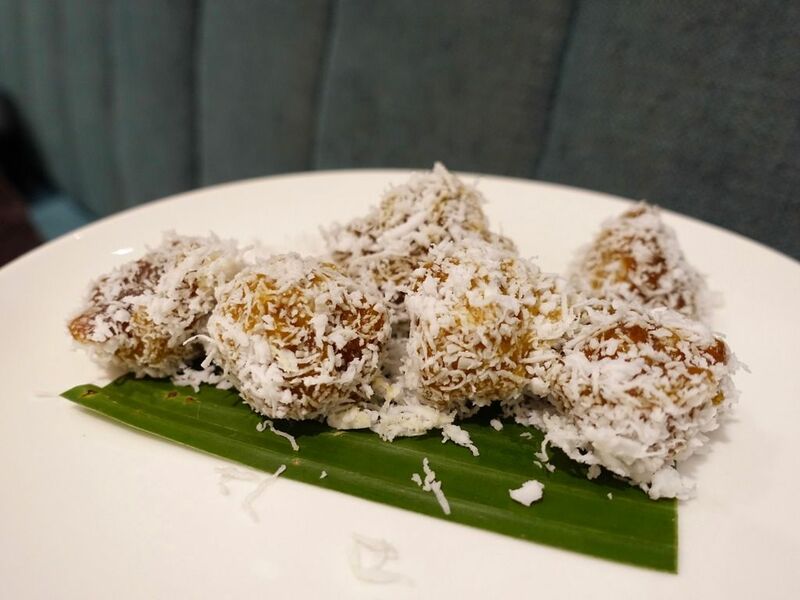 Save room for the dessert highlight which is Kueh Kosui ($6), a steamed tapioca kueh with gula melaka and grated coconut. The kueh is super soft and has a caramel like texture (without the stickiness). I love how this dessert is salty sweet and not overly starchy. 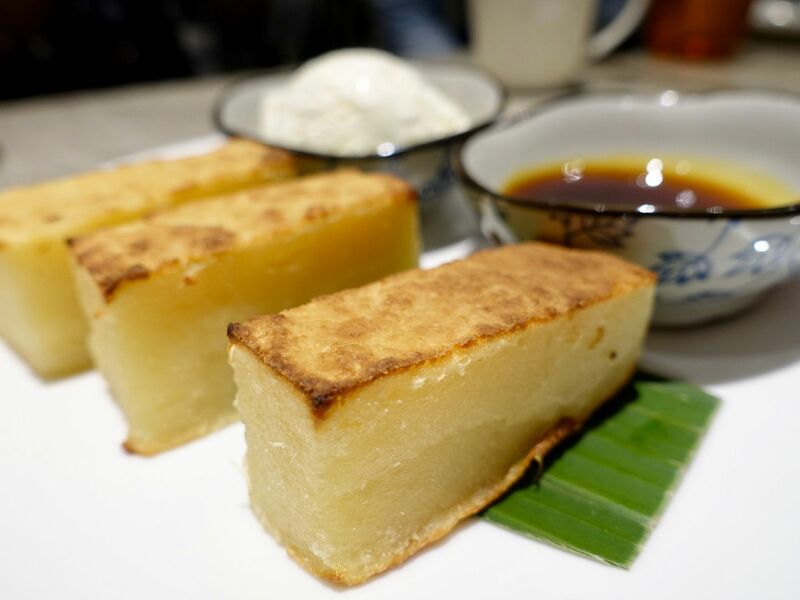 A different type of tapoica cake is the Kueh Bengkah with vanilla ice cream ($10). Here, the tapioca cake is grated, mixed with eggs, coconut milk, corn starch and pandan leaves before baking. P.s. pick the darker brown pieces! Oh and give it a good dip in the salty gula melaka! 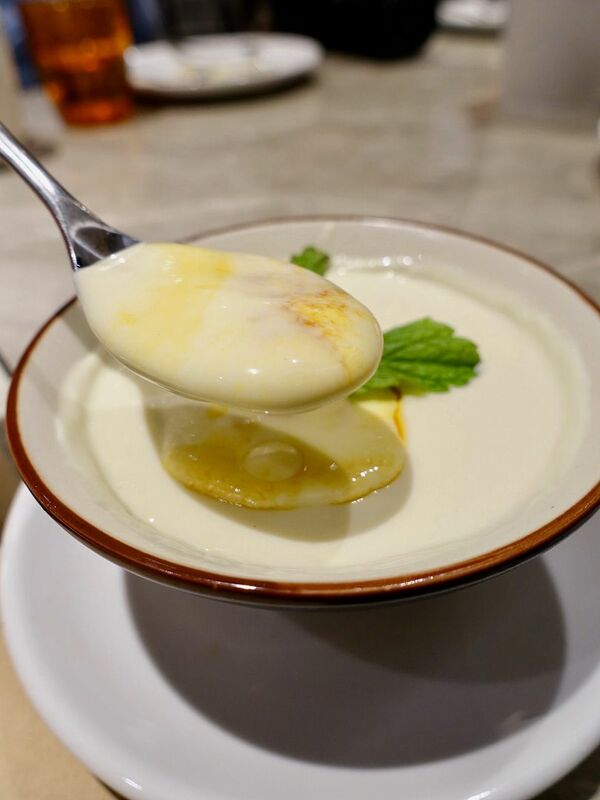 If you like melted coconut ice cream, the Baked Custard with Gula Melaka ($12), inspired by the Spanish Koka dessert. It's a rich coconut milk sauce IMO and i feel that it should be more pudding-like. 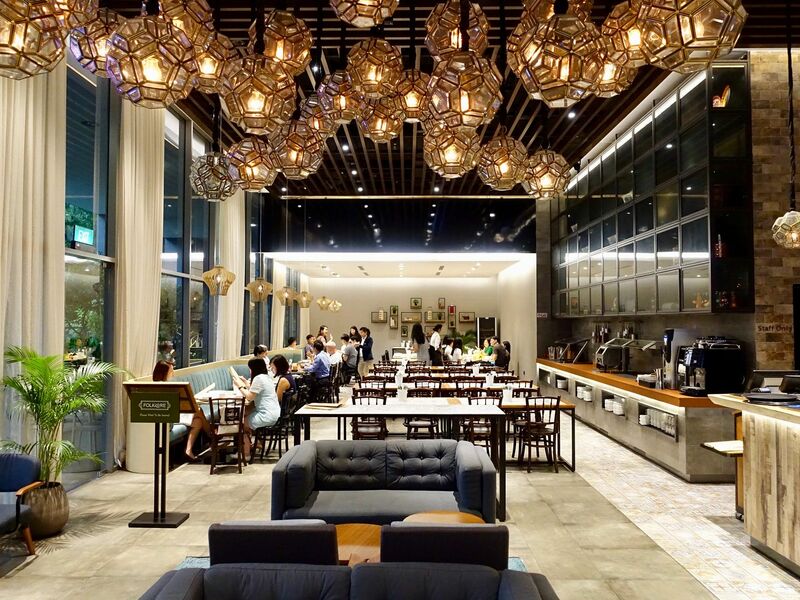 Skip this and go for the Kueh Kosui! Folklore is a lovely place for a communal meal with the family and friends. Chef Damian plans to launch a promotional menu every 2-3 months featuring specials. He will be kicking off with a series of lunch and dinner heritage dishes in conjunction with the a la carte menu.